Making the most of each pregnant "Pinter Pause" with telling expressions and vibrant body language, director Braden Abraham delivers a gem in Seattle Rep's current production of the 2005 Nobel Laureate's 1978 Betrayal. Based on a period in his own life, Pinter's script explicates an affair between Jerry and his best friend Robert's wife, Emma, in reverse order, from a poignant reminiscence by both parties to the initial moment when Jerry confessed his desire to Emma. The period setting provides context that contemporary adaptations of this piece seem to lack, adding punch to the emotional body blows. Edgy original music (by Obadiah Eaves) and haunting silhouetted film sequences (by L.B. Morse) during scene changes underscore the unspoken anxiety underlying the story's reckless interpersonal duplicity. 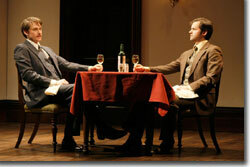 Within the confines of Pinter's characters' muted exteriors, Cheyenne Casebier (Emma) and David Christopher Wells (Jerry) provide a dynamic subtext ranging from love and infatuation to bittersweet resignation. Alex Podulke's Robert, as the cold and calculating counterpoint, continually surprises. A warm performance by John Farrage as the waiter rounds out the top-notch production. Seattle Rep's Betrayal runs through March 28th in the Leo T. Kreielsheimer Theater. 206-443-2222.